Would you like to see an end to the shipment of greyhounds exported for commercial USE (i.e. breeding, hunting, showing, racing, fighting)? Greyhounds are suffering extensive abuse and inhumane death across the world due to the exports of Irish and UK greyhounds. Transporters/agents/breeders/trainers regularly export the dogs without any care for their wellbeing. A) Many greyhounds exported from the UK and Ireland are sold or loaned out for breeding. Both female and male greyhounds can end up in breeding kennels living in severely 'inhumane conditions', often in excessively high temperatures until they can no longer produce, leading to years of misery and suffering. Each female may produce a litter of around 10 puppies and will be used to whelp as many litters as possible throughout her life. They may suffer infection or other serious complications during or after the birth, often with little or no vet treatment. One male can sire tens of thousands of dogs and will usually remain in a kennel for his entire life. B) While used for hunting these dogs sustain injuries such as being mauled by other animals, and receive no vet care often leading to a slow, painful death. C) Greyhounds are used for racing at both licensed and unlicensed racing tracks. When no longer fit to race (due to age, injury, etc.) the dogs become surplus to requirements, resulting in many being poisoned, bludgeoned, hung, or even slowly cooked to death as greyhounds are at present being found within the Chinese dog meat trade. D) Some individuals may proclaim to look after their imported dogs. However, with serious issues of poverty, lack of education, no access to vet treatment and unsuitable climate, these owners are unable to provide even the most basic of care such as proper diet or vaccines to prevent illness and disease. Only exports for the specific purpose of re homing via well established and reputable rescue can ensure that a dog's welfare needs will be met. A) Studies in the US have shown that greyhounds have type A Personalities, which makes them extra sensitive in stressful situations and can lead to excessively high blood pressure, causing a whole array of health problems including stroke and death. B) They have universal blood, which makes them highly susceptable to being bled to death ('exsanguination') for profit, rather than being put to sleep using IV euthanasia when necessary. C) Greyhounds have very little fat on their bodies, making it very uncomfortable for them while crammed into crates or left to lie on hard surfaces. D) Greyhounds are temperature sensitive, meaning they do not have the ability to adapt to hot/cold climates, in the same way as some other breeds can. This can lead to overheating, seizure and horrific death. The exports are creating mass breeding of greyhounds, meaning that millions will be exploited in the future. If we do not stop the exports now the problem will spiral out of control because of the growth of greyhound breeding facillities, dangerous race tracks and hunt kennels around the world, together with a lack of animal welfare laws in some countries and non enforced animal welfare laws in others. UK transports UK to France to China - UK to US to India - UK to Pakistan. UK dogs are also returned to Ireland before travelling via the above routes. We would therefore like to contain all Irish and British greyhounds within Irish/UK borders, with the exception of exports to assist European greyhound rescue organisations with their vital work. We would call for neutered/spayed dogs to be shipped from well established and reputable rehoming centres to those matching the same criteria overseas, and which have long term history of re homing dogs to a family environment for non commercial use. We are aware that some greyhound trainers are deceptively exporting greyhounds, who are no longer registered to race, as 'pets'. These dogs are usually used for breeding, hunting and racing rather than homed as pets. In order to assist genuine pet exports in cases of immigration, a solution would have to be found to filter out such illegitimate exports. We believe that we have a duty to make a strong attempt to contain all greyhounds in the UK and Ireland, prior to calling for closure of all tracks (with exception of rescued greyhounds, being shipped by legitimate rescues to their counterparts in countries that have up to date animal welfare laws) We shall continue to campaign against greyhound racing, but will prioritize our work to end the cruel exports. 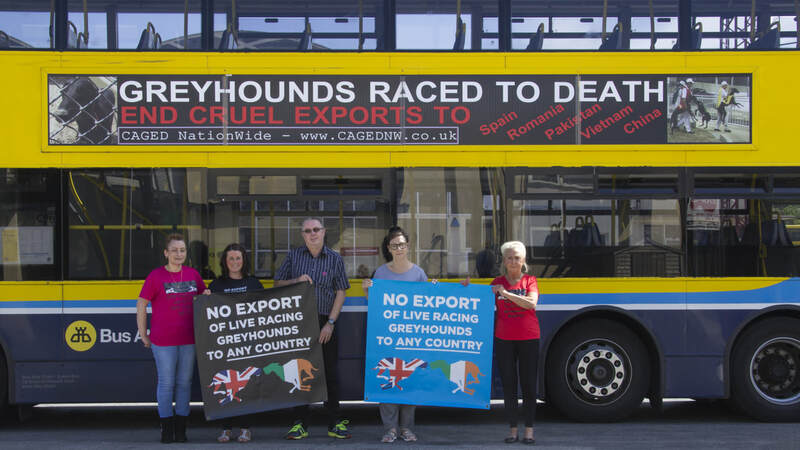 In relation to a ban on all greyhound exports for commercial USE* from Ireland and the UK, we would like to lobby both the Irish and UK racing industry and all necessary government officials within the EU. If you are a rescue or welfare organisation that would like to support the blanket ban. Please contact us at info@cagednw.co.uk indicating your approval. Please do not hesitate to contact us with any queries. * We define commercial USE as being exchanged/loaned for personal financial or other gain, and/or being bought/borrowed to be used for breeding, hunting, fighting, showing or racing.